This will be the 3rd season for the Rollerblade World Team. Last season, the team captured many Top 2. This coming one, everyone hopes to hit some 1st places. Under the lead of Ewen Fernandez, the Rollerblade World Team will start a third season on the circuit. Last one was great, with many wins and many podiums. We all remind the epic sprint of the Berlin Marathon where Ewen took the silver behind Bart Swings (Powerslide) and Guillaume de Mallevoue captured the 4th place in front of a large peloton. We also remind the 2nd place of Ewen (individual) and the team (team ranking) at the World Inline Cup ranking. And the numerous second places Mike Paez captured at the PanAm games for his national team of Mexico. We at least remind that the team was able to win in very different kind of races: Ewen took the victory at the 3 Tracks Trophee and the 100k of the Roll’athlon, Guillaume finished 1st of the Lyon Marathon and the young gun Doucelin Pédicone captured the gold at the Madrid Marathon, in front of experienced skaters. 2019 will be the golden season, hopefully. Ewen, Fernandez, Guillaume de Mallevoue, Doucelin Pédicone, Quentin Giraudeau and Mike Paez will compete to do their best, and capture some other wins. The main goal will be the World Inline Cup of course. But the athletes also hope to take the gold at their national championships, as well as their continental or world championships. 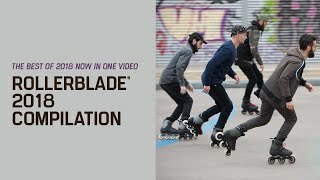 This year, the World championship of the marathon distance will be held in Barcelona: this could be cool to see a Rollerblade World Team member with the rainbow jersey!